Indoor cycling workouts are inevitable for most cyclists living in cold weather climates. While some will brave the cold weather daily, vowing to never train indoors, others will seek the benefits indoor cycling brings. Indoor trainer or roller workouts are great, allowing you to execute a workout precisely. At the same time, training indoors can lead to several issues, such as overuse and underuse of certain sport specific muscles. This can lead to tight areas and imbalances. Combining certain strength and flexibility exercises off the bike will help prevent these issues from arising and make the indoor training season a productive one. While indoor cycling has its advantages, it is important to incorporate some outdoor riding, or other activities such as hiking or running, through the winter months. The drawbacks to training indoors include the lack of side to side movement, pedaling in a fixed position, and the lack of position shift when climbing a hill. When riding outside, you are pulling on the handlebars, engaging your core and shifting your hips with the turns and obstacles. These specific movements are hard to replicate indoors. So, a bike ride on a cold snowy day may not be as focused on specific training zones as an indoor trainer ride will be, but the benefits from the balance and shift in movement on the bike will outweigh the lack of focus on intensity. Training indoors will allow you to focus on very precise interval duration and intensity, allowing you to train in a very efficient way while targeting the prime movers for cycling. The lack of upper body and core engagement also places more emphasis on your primary cycling muscles. Your prime movers for cycling include your quadriceps, hamstrings and glute muscles (Primary muscles used for cycling). The greater demand on the prime movers means you will work those muscles slightly harder indoors compared to the same effort outside. This commonly leads to tight hamstrings, quads, hips and hip flexors, which then leads to other issues such as tightness around the knees and lower back. Each of the exercises below targets the imbalances that can occur from indoor cycling. These exercises can be added to any training program, as long as you are following proper repetitions and sets for your training focus, and ability. Renegade rows are very effective for cyclists. This exercise targets the upper back, triceps, shoulders and abdomen. Adding pushups between reps and sets can add a variation to this exercise. This exercise is performed with repetitions either alternating sides or focused on one side first. Back extensions strengthen the lower back and help create a balanced core. The exercise above is usually held for durations of 10-20 seconds per round. It is important to work with straight arms, reaching them forward, and with straight legs. Side planks will help target your oblique muscles, while also slightly working the shoulders and hips. The lack of side to side movement indoors makes this exercise important. 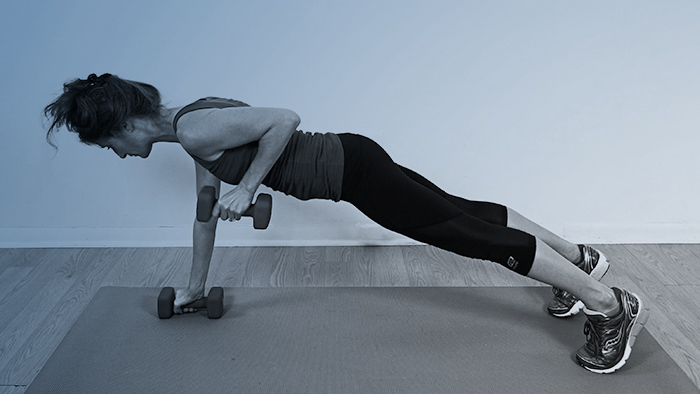 Side planks can be held for durations of 30-60 seconds per round. Always focus on lifting the hips, never letting them sag. The bound tiger is a great exercise. This pose not only targets the back muscles, it also stretches the quads and hip flexors at the same time. The Bound Tiger is usually held for 10-20 seconds, per side, per round. If you lack in shoulder and/or hip flexibility, a strap or towel can be used around the foot to help you reach and bind the pose. Hamstring stretches are very important when indoor training. The stretch below is an intense hamstring stretch. There are many variations for this stretch including not crossing the legs and simply folding forward. The hamstrings play a huge role in the pedal stroke, so don’t overlook this one and hold for 20-30 seconds each round for each side. Tight hip flexors are very common in cycling. One of the easiest stretches for hip flexors is the lunge. Press your hips forward to deepen the stretch. Reaching your hands overhead will also deepen the stretch (Also known as Warrior pose in Yoga). Hold for 20-30 seconds each round. Deep hip stretches are important through the winter training season. In the below pose, the right hip is targeted. Always listen to your hips and knees with this pose and back off if you experience any discomfort. Hold for 20-30 seconds each round. Back, neck and shoulder stretches are very beneficial. These areas are all commonly tight from training indoors often. In the above stretch, press with the legs, let your back round outwards and keep the chin close to the chest. Hold for 20-30 seconds each round. There are many core exercises and stretches that are beneficial though the indoor season. Planks, crunches, leg lifts and any exercise that requires core stability is a benefit. When training indoors, keep focused on stretching the areas that feel overworked and strengthening the areas that are underused. This will help get you get through the winter season, achieving the best fitness possible.